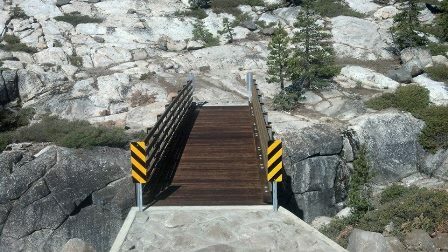 The Bridge was completed in fall 2013 and was a nice addition to the trail. 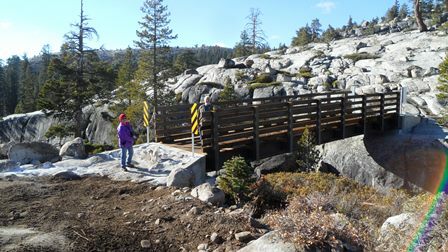 The old creek crossing and abandoned segments of the trail have been restored to nature and are no longer part of the trail. The bridge fundraiser held on March 21st, 2009 at Placer County Fairgrounds was an excellent start to our fundraising effort. Check back to this page on a regular basis to get the latest updates on this project. Thank you to all for you donations and contributions. 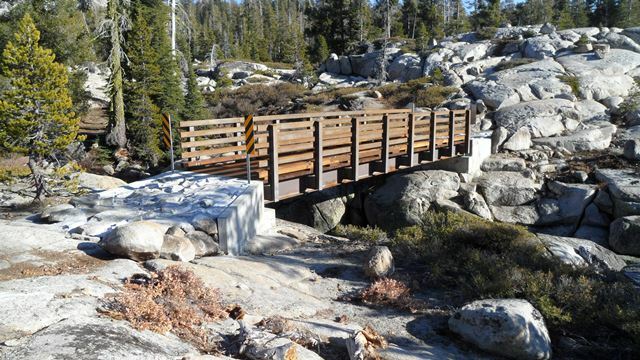 The OHMVR Division proposes to award grant funds to the Eldorado National Forest for construction of a bridge on the Barrett Lake 4WD Trail and the re-route of the existing trail to connect with the bridge. 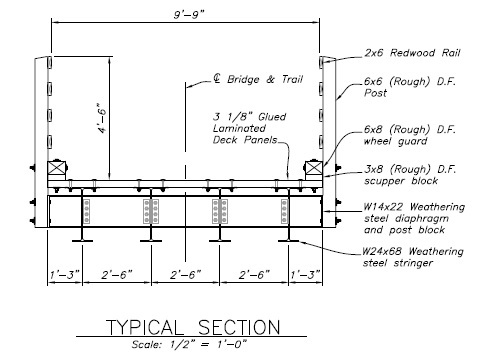 A 45 to 50 foot long wood and steel bridge would be constructed to span the Jones Fork of Silver Creek, replacing the current wet creek crossing (where vehicles drive through the creek). Approximately 0.5 miles of new trail would be constructed to connect the bridge with the existing trail alignment. In accordance with CEQA, OHMVR Division is soliciting comment on the adequacy and completeness of the IS/MND. The IS/MND is available for public review and comment through October 8, 2012. 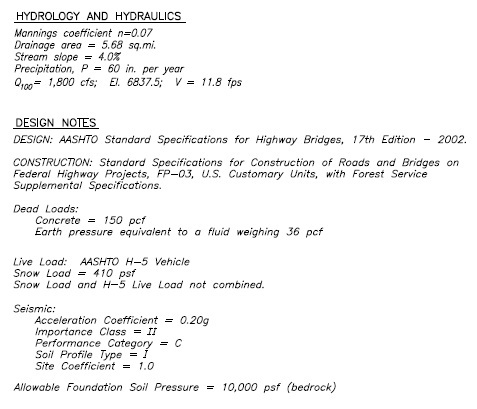 Barrett Lake 4WD Trail Bridge Project IS/MND Documents: (Click on below link to download documents in PDF format). The Hi-Landers 4Wheel Drive Club has worked with the Forest Service to manage and maintain the Barrett Lake Jeep Trail for over 30 years. 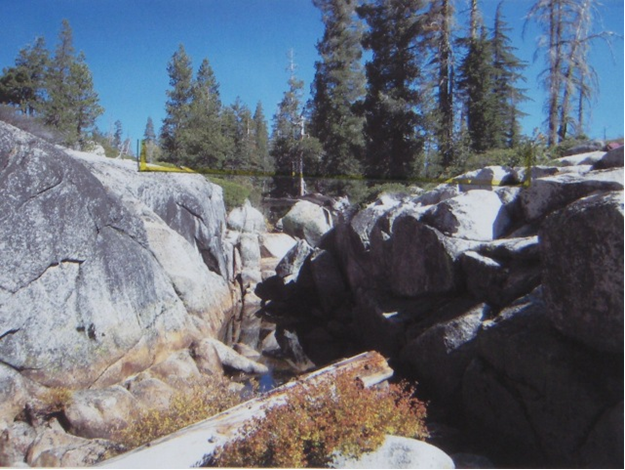 This not only includes the yearly clearing of the trail to open it, but also includes trail and camp site maintenance, along with the closing of unauthorized "reroutes" and the constructing of authorized ones. About six years ago the Club started talking with the Forest Service about putting a bridge over Jones Creek. The sight for the bridge, chosen by input from the Hi-Landers and Forest Service, will eliminate not only the fording of Jones Creek but also one of its small tributaries. 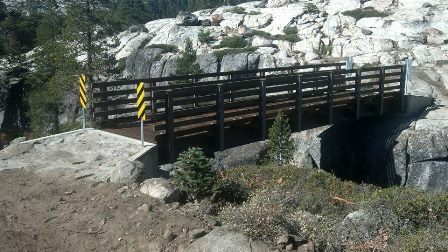 This fact and the fact that the trail is a multi-use trail, makes this bridge a project the Forest Service has continued to move forward on. 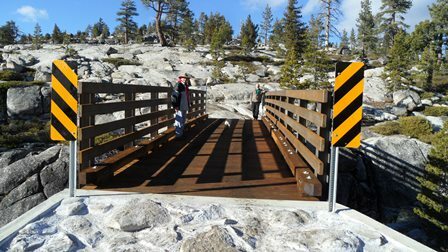 To date the chosen location of the bridge has been reviewed and approved by archeologists and engineers for the Forest Service. The project is currently in the Bridge Design phase. The Bridge will be a steel structure approximately 40'-45' in length. The plan has always been for the bridge itself to be funded by Green Sticker Funds. However, one of the recent changes in the management of Green Sticker Funds is that all projects require some private funding, at least 25%. The 25% funding includes volunteer labor for a project. 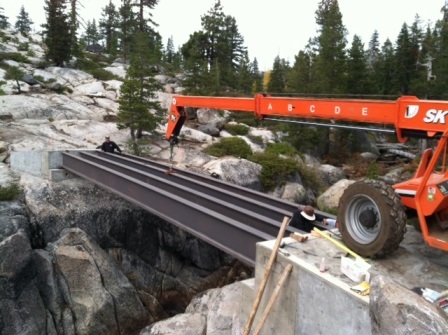 We expect to provide volunteer labor for the trail reroute, to and from the bridge site and as much of the bridge installation itself as we can. However, we also wish to show our sincere interest in this project by providing monetary funding as well. As 4 wheel drive enthusiasts we are sure you understand the importance of this project, and we are offering you an opportunity to be part of it, both monetarily and through volunteering your time. Please contact Frank Funk, Hi-Lander 4 Wheel Drive Club, Conservation Chairman at barrettlakebridge@gotfj40.com concerning your contribution. Below are snapshots from the proposed design draft. Copyright 2014 hi-landers.com. All Rights Reserved.